Indulge me a moment, dear readers. Seeing my work alongside articles by the awesome authors and brilliant bloggers showcased in Speculative Fiction 2012 was a point of proper pride for me last year. Leafing through the contributor's copy I got—or maybe it was one of the ones I bought—I'm no less proud now. More importantly for me, at least, the anthology legitimised, in others' eyes, what I spend my days and nights doing. No matter how many times I told my Mum what I was up to, it wasn't till she saw my name on a printed page that she realised I might not be the good-for-nothing lump she had imagined. I admit I may be overstating her former fears about me, but it's true, to be sure, that she's crowed about the book pretty much continuously since. Whenever I visit, she calls me her "writer in residence." An endlessly embarrassing business. But also... well. A little lovely. It dawned on me this morning that there'll be no stopping her now. After all, the most estimable editors of the next iteration of the anthology recently revealed the cover of Speculative Fiction 2013, designed—as was the last one—by Sarah Anne Langton. Abigail Nussbaum, Aidan Moher, Alasdair Czyrnyj, Aliette de Bodard, Alyssa Franke, Amal El-Mohtar, Ana Silva, Ann Leckie, Annalee Newitz, Bodhisattva Chattopadhyay, Carrie Sessarego, Chaila, Cheryl Morgan, Chiusse, Chris Gerwel, Diane Dooley, E.M. Kokie, Emily Asher-Perrin, Erin Hoffman, Foz Meadows, Gavia Baker-Whitelaw, Jared Shurin, Jemmy, Jenny Kristine, Jim C. Hines, Joe Abercrombie, Jonathan McCalmont, Justin Landon, Kameron Hurley, Karyn Silverman, Kate Elliott, Leow Hui Min Annabeth, Liz Bourke, Mahvesh Murad, Matt Hilliard, Miguel Rodriguez, N.K. Jemisin, Natalie Luhrs, Niall Alexander, Nina Allan, Orem Chiel, Paul (Sparky), Phoebe North, Renay, Robert Berg, Sam Keeper, Sayantani DasGupta, Shaun Duke, Sophia McDougall, Stefan Raets and Tansy Rayner Roberts. I was totally going to tell you which article Ana and Thea picked to represent my writing through 2013... before I realised how much more fun it'd be to let you guess. I'll say that it's a review—which will surprise no-one, of course; by and large, for good or for ill, that's what I do these days—but also that it's a piece I'm particularly proud of. I'm doubly pleased to see a pair of my peers agree. 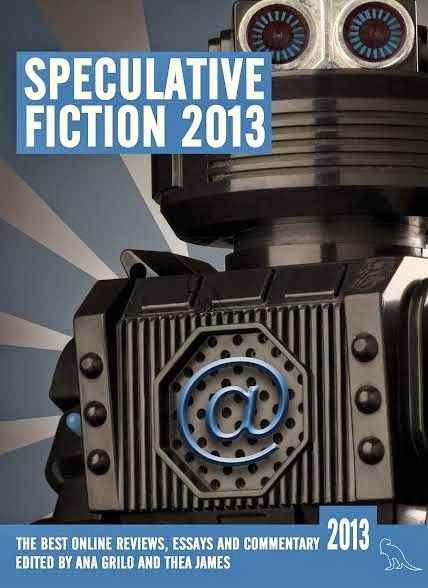 Time to post this puppy, but before I go, know that Speculative Fiction 2013 will be released in April. The listings aren't live on Amazon as yet, but as and when you're able to place your orders, remember that all the profits will be donated, as they were last year, to Room to Read: an awesome cause on top of the progressive premise this annual anthology evidences in any event.